At a moment when he could do nothing other than obey the pull toward life’s unexplored and unusual places, Jacob realized that those words sparked by his own freedom were able and perhaps even intended to remove life’s shackles from those he would come to know as “fellow travelers.” Millions were touched by this broad-stroked call to weirdness, flocking to a Facebook community and inspired in-person gatherings where they could connect with other seekers and creatives. In half a decade as the keeper and curator of The Weirds, it became clear to Jacob that a certain demographic craved more: greater license, specificity, and recognition as they traversed the winding road of life design and liberation. As The Tribe continually offered material and inspiration for a longer-form work, he nurtured a growing hope that his words might inspire soulful creativity that could help humans answer the question of purpose and meaning in an era starving for both. This book is not about convincing individuals of their weirdness or the value of that quality in others – it explores the valuable, unique manifestation of oddity in each of us, powerful enough to bring about revolution and redemption. On this narrative journey throughout history, readers are reminded that creative genius is the birthright and imperative of human nature and not limited to a chosen few. Heartfelt and humorous in places, this book provides comfort to those who have felt that the modern world had no place for their “weirdness,” and it serves as a call to action for those who desire to come step into a richer and more fulfilling existence. While not primarily a book about political or social change, the author demonstrates that real progress begins within our own arms’ reach—at home and in our own backyards. Ultimately this is an invitation for humans to seize the advantages of our day and create lives that are works of art. 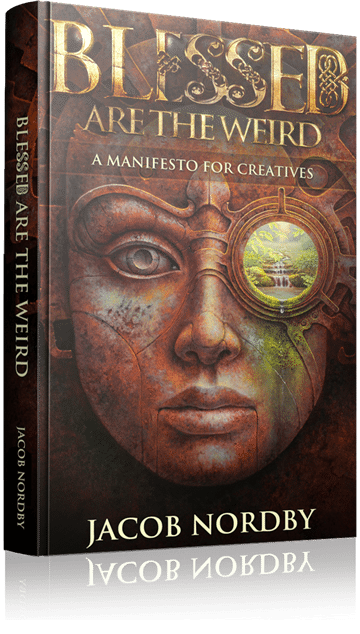 Blessed Are the Weird is available in eBook, hardcover, and paperback on all major online retailers. Bookstores may order through Ingram on a wholesale returnable basis in the US, Canada, UK, Europe, and Australia. * Audio version for Audible & iTunes coming soon!